Beginning March 28th, guests will be able to indulge in Church’s Chicken’s® latest creative entrée, Honey-Butter Biscuit Tenders. Fans of crisp, hand-battered, juicy fried chicken and flaky, buttery, scratch-made biscuits can now have the best of both delicious worlds, thanks to Church’s Chicken’s® latest creative entrée. Beginning Monday, March 28th, the nationwide chicken chain will introduce new Honey-Butter Biscuit Tenders – an inventive combination of two of the brand’s most popular menu items. For a limited time only at participating locations, guests will be able to delight in all-white-meat Tender Strips® that have been dipped in Church’s® famous Honey-Butter Biscuit batter then fried to a delicious golden brown and paired with sweet Honey-Butter dipping sauce. It’s yet another way the brand is continuing to deliver the quality and flavor that keep people coming back to Church’s time and time again. Available through May 22nd, while supplies last, Honey-Butter Biscuit Tenders can be substituted for classic Tender Strips® in any combo or meal deal, and also in a number of limited-time-only combos. An order of 3 Honey Butter Biscuit Tenders, served with Honey-Butter dipping sauce and a biscuit starts at just $2.99. The beloved brand welcomed Tender Strips® to its menus in 1992 and just a few years later, the brand introduced their famous Honey-Butter biscuits to Church’s menu. For a limited time only, guests can indulge in two of their favorites with this unique flavor mashup. Founded in San Antonio, TX in 1952 by George W. Church, Church’s Chicken is one of the largest quick service restaurant chicken chains in the world. 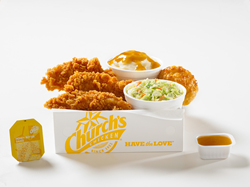 Church’s specializes in Original and Spicy Chicken freshly prepared throughout the day in small batches that are hand-battered and double-breaded, Tender Strips®, sandwiches, honey-butter biscuits made from scratch and freshly baked, and classic, home-style sides all for a great value. Church’s (along with its sister brand Texas Chicken® outside the Americas) has more than 1,650 locations in 25 countries and international territories and system-wide sales of more than $1 billion. For more information, visit http://www.churchs.com. Follow Church’s on Facebook at http://www.facebook.com/churchschicken and Twitter at http://www.twitter.com/churchschicken.